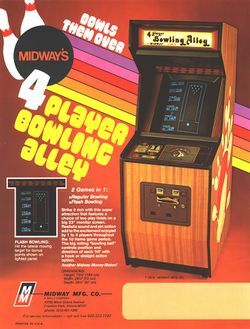 4 Player Bowling Alley is a bowling arcade game, which was released by Midway Games (in 1978); it uses an Intel 8080 microprocessor (running at 1.9968 MHz), and the players must use the trackball to guide a bowling ball towards the ten pins in order to knock them down. At the start of the game the players must choose between "regulation" and "flash" modes - and this was the first bowling game to feature the "flash" variation with a time-based scoring system. An external display was utilized by the cabinet to highlight the appropriate section of the scoring system as a result of it; however, if you use MAME to play this game, this will not be emulated. The text "NOW BOWLING" will appear above the number of the player who is currently taking his turn (instead of only "BOWLER"), and there is also a single button to switch between straight and hook shots - however, if your ball goes off the top of the screen, the text of "FOUL SHOOT AGAIN" will appear and you will have to take your turn again. The fifth and tenth frames are also referred to as "beer frames" by the game, and just like in real bowling, whoever has the highest score at the end of the game will get declared the winner; the perfect score (for "regulation" mode) is 300, while in the time-based "flash" score mode, the perfect score is 7500. This page was last edited on 19 April 2014, at 09:58.